In spite of the difficulties that were experienced at customs in the Haiti Port, the water purification system that Agape sent to the Ça-Ira Children´s Home is now up and working for the children and for the community. Thanks to this new arrival, now the 100 orphans and the 220 other students that attend the primary school in the center of town are directly benefiting from the tremendous contribution that the purification system is making toward good health. In addition, it seems that the news of this system has spread to the nearby towns and many people are coming for the fresh, clean water, something still quite new in the area, in spite of the fact that it´s already been three years since the 2010 earthquake. Until now, the water that the children´s home used came from a well that GAiN built shortly after the earthquake, but there wasn´t 100% confidence of its potability. Now, thanks to the purification system, which filters the water from that same well, the water comes out completely clean. We want and hope that many more people come to know and have access to this water, knowing how important it is for the Haitian community, especially for the children, to have access to clean, quality water. The sending of the portable purification system, H2Optima, was a joint effort by GAiN Spain and Optima Renovables, the creators of the purification system. 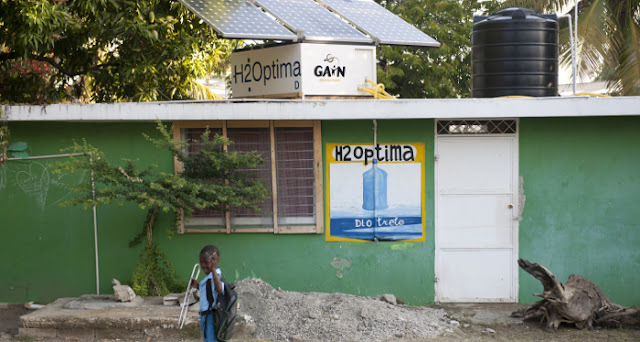 The copmany donated the machine without cost so that those with such great need, like those in Haiti, could benefit from its numerous advantages, for example, the system is solar-powered, something very important in Haiti, given that the cost and the inconvenience of other types of energy.